Frameless shower screens are a spectacular addition to any bathroom in Tingalpa, providing that modern touch of sophistication you’re searching for. Stylish, elegant and modern, our glass shower features can change an ordinary area into pure functional elegance. Diligently crafted in our warehouse, our products bring a piece of high-end to any remodelling. You are bound to discover the best feature to mix with your decor and raise your showering experience to an entire brand-new level of convenience. Popular frameless shower screen designs in Tingalpa include corner options, fixed partitions, over bath, wall to wall, U-shaped or rectangle-shaped and lots of others. Our warehouse also offers a large range of structural choices for you to select from, consisting of corner splay diamond, single panel walk in partition, corner square, or even moving doors. We understand that it’s not possible to interest each personal palate, which is why we provide our customers the option to create customized shower screens from our warehouse. If you have a specific style or a difficult area to deal with, our team can help you complete your bathroom to your requirements. Just go to our site and fill in a request for a quote. No need to stress over costly and extensive bathroom restorations anymore – we can provide you an economical, smooth and fashionable appearance that makes certain to create a room you can be happy with. Thanks to our customized shower screens, you can ensure that we have a service to suit you. With exquisite workmanship and high-grade materials, our customized and pre-made products make efficient use of a small bathroom’s limited space. The glass panels give the impression of space and light, hence making your bathroom appear larger and more inviting. The addition of elegant glass shelves is a lovely but practical feature that declutters your shower recess. 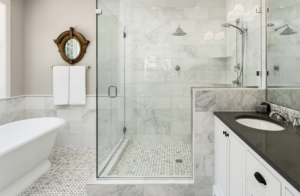 Moreover, frameless showers are the more hygienic and safe choice for your household: the absence of unneeded frames means that dirt, gunk and germs have no space to live in, while the containment of water within the enclosure substantially lowers the threat of slipping on wet floor tiles. The Frameless Shower Screen is the pinnacle of high-end and trendy style in Tingalpa. Readily available also as a panel or above bath swing, our special frameless screens will bring the finishing touch to any contemporary bathroom. Our fittings are quality chrome plated brass and are available in Chrome, Satin (Matt) and Gold finish. We offer Bevelled, Flat and round hinges and wall brackets. We provide a choice of over 15 knobs and handles. We believe our hardware choices will satisfy all your needs for compatibility with existing taps and vanities. These screens use you the most economic choice for your shower recess. Offered in pivot or sliding doors we utilize 6.38 laminated safety glass or 6mm toughened glass. All panels and doors are fully enclosed by aluminium. Unlike the frameless or streamline alternatives there is an aluminium column where the side panel meets the front of the screen. Pivot doors only open outwards not both ways like the frameless or streamline options. Sliding doors are offered in 2 or 3 doors. As these screens have an overlap where the door meets the infill they are usually more water tight than other screen alternatives. Also offered as a panel or above bath. Every screen is custom made for your shower recess. There are 7 options of colour for anodised or powder coated aluminium frames. These screens use handles rather than knobs to open and close. Our ever popular semi frameless shower screen offers 6mm toughened glass, clear or frosted. Whether you choose sliding or pivot doors there is only metal on the top and bottom of the door. Pivot doors just open in the outward direction. Unlike the frameless or streamline alternatives there is an aluminium column where the side panel meets the front of the screen, using greater stability. As these screens have an overlap where the door meets the infill they are usually more water tight than other screen choices. Likewise readily available as a panel or above bath. Every screen is custom made for your shower recess. There are 7 options of colour for anodised or powder coated aluminium frames. We provide a choice of over 15 knobs and deals with. Whether you would like a screen definitely custom-made developed to fit your unique area or a simple stock-standard solution, our warehouse has the materials to style a sophisticated frameless function for your shower. Contact our friendly team of experienced personnel today to discover how you can attain the bathroom of your dreams.